This is the second card that I made with little "Grace Summertime" from the Fresh Brewed Design Shop! They have a challenge at the Latte Lounge to make a card using Pink and Aqua. I just so happen to LOVE those two colors so I made this card! LOL! The only problem is that I don't think I have figured out how to enter their challenges yet! I'm still learning my way around the sight. I colored little Grace with my copic markers. The cardstock is Stampin Up Pretty In Pink and Regal Rose. Then I used my new Trellis punch from EK Success and had lots of fun adding some pretty paper roses. The ribbon and pretty crocheted flower doily are from the treasures that my mother gave me! Thank you, Mom! Freshly Brewed Challenges "A chance to be a guest featured designer"
Oh my goodness how sweet this is!!! I LOVE the soft colors and the beautiful flowers covering the lattice border. 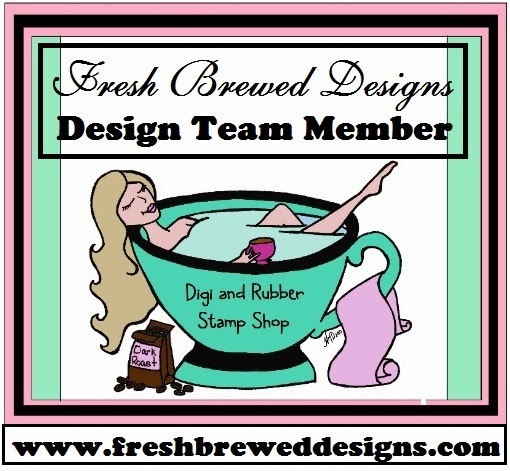 Thank you so much for playing along at Fresh Brewed Designs on The Latte Lounge and for sharing it at FBChallenges!!! LOVE IT!!! So sweet! I love the pretty bow.